An Irish monk throws an engraved bronze bottle into the sea in A.D. 834, praying its one-word message will reach a hurting soul. Follow the legacy of the mysterious vessel as it touches the lives of an Irish princess, a Scottish story weaver, a post-colonial nurse, a cotton mill worker, and a maid suffering from amnesia. 448 pages, softcover from Barbour. When a Viking bent on revenge mistakenly raids the castle of a bookish Irish princess, will she cast her fears aside to befriend the enemy, finally realizing Gods plan for her life? When a Scottish story-weaver loses her family in a clan war, she finds herself aided by a handsome, secretive bagpiper in a race against time to reunite with someone she never dared hope she'd see again. As a champion of the sick, a young New Yorker never doubted her worth until a new doctor arrives to work with her father, one who believes her to be nothing more than a social butterfly. Can she gain his respectand his love? When a Georgian cotton mill worker is arrested and sent North, the Union officer who tries to protect her is the last person she wants to forgiveand the only man who can bring hope and healing to her heart. After washing ashore on the California coastline, a young womans yearning to discover her past leads her to the courageous oarsman who helps her find the key. Joanne Bischof has a deep passion for Appalachian culture and writing stories that shine light on Gods grace and goodness. She lives in the mountains of Southern California with her husband and their three children. When shes not weaving Appalachian romance, shes blogging about faith, folk music, and the adventures of country living that bring her stories to life. She is a Christy Award-finalist and author of Be Still My Soul, Though My Heart is Torn, and My Hope is Found (WaterBrook Multnomah). www.joannebischof.com. Amanda Dykes is a drinker of tea, dweller of Truth, and spinner of hope-filled tales. She spends most days chasing wonder and words with her family, who love a good blanket fort and a stack of read-alouds. Give her a rainy day, a candle to read by, and an obscure corner of history to dig in, and shell be happy for hours. Shes awed by the strong thread of Gods grace and provision woven through every era, and hopes her stories reflect that grace. A former English teacher with a B.A. in English Education, she is the author of the critically acclaimed Bespoke: a Tiny Christmas Tale, and enjoys connecting with her readers at www.AmandaDykes.com. HEATHER DAY GILBERT writes novels that capture life in all its messy, bittersweet, hope-filled glory. Born and raised in the West Virginia mountains, generational story-telling runs in her blood. Heather is a graduate of Bob Jones University and is married to her college sweetheart. Having recently returned to her roots, she and her husband are raising their three children in the same home in which Heather grew up. Heather's Viking historical novel, God's Daughter, is an Amazon Norse Bestseller. She is also the author of the bestselling A Murder in the Mountains mystery series, and the Indie Publishing Handbook: Four Key Elements for the Self-Publisher. 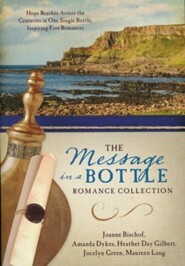 Jocelyn Green inspires faith and courage as the author of more than ten books to date, including The Mark of the King, and the award-winning Heroines Behind the War Civil War series, which includes Wedded to War, a Christy Award finalist in 2013; Widow of Gettysburg; Yankee in Atlanta; and Spy of Richmond. She also co-authored The 5 Love Languages Military Edition with bestselling author Dr. Gary Chapman. A former military wife herself, her passion for military families informs all of her writing as well as her numerous speaking opportunities. Jocelyn graduated from Taylor University with a BA in English and now lives with her husband and two children in Iowa. Visit her at www.jocelyngreen.com. 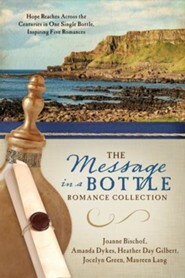 I'm the author/artist and I want to review Message in a Bottle Romance Collection: Hope Reaches Across the Centuries Through One Single Bottle, Inspiring Five Romances.